We’d love your help. Let us know what’s wrong with this preview of Over the Next Hill by Dorothy Ayers Counts. Living either full or part time in a recreational vehicle has been an alternative lifestyle in North America since the 1920s. By the 1930s, Wally Byam's Airstream company could not keep up with the demand for his self-contained "house trailers." And today, "RVing" has become so widespread that, for perhaps two million retired North Americans, home is a recreational vehicle. 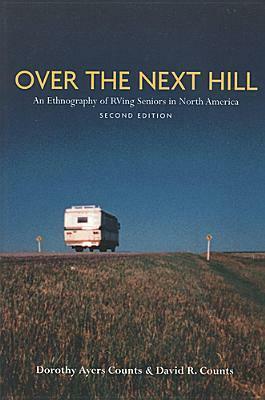 In this book, anthropologists Dorothy and David Counts tell the story of their research living the life of RVing seniors in trailer parks, "boondocking" sites on government land, laundromats, and other meeting places across the continent. The authors convincingly convey the feel of various RV lifestyles (boondocking, full timing, flea marketing and so on). But they also raise broad questions. Are there parallels to be made between the RVers of North America and the gypsies of Europe? Is there an association between RVing and socio-economic status? Why would people sell their homes and live on the road as nomads? The answers come from RVers who argue persuasively that they experience a greater sense of community and fewer of the emotional problems common to old age than do many who have chosen other forms of retirement living. This edition expands the original 1996 text, including an extended section on working RVers and on the CARE center (Continued Assistance for Retired Escapees) in Livingston, TX. The CARE center is a unique and innovative experiment that provides inexpensive assisted living and adult daycare for RVers who must hang up their keys because of age or infirmity, but who want to continue their participation in the RVing community. A new appendix (Appendix 5) offers information, resources and suggestions for people who want to try serious RVing but need help getting started. The authors include a list of websites providing resources and information for both experienced and novice RVers. The list includes sources for RVing families, single RVers, those interested in a particular kind of RVing style ("boondockers," for example), people who want to rent an RV, organizations for RVers with special interests (former military, Canadians, etc.). There is updated information on Canadian provincial residence rules defining eligibility for provincial medical care programs. To ask other readers questions about Over the Next Hill, please sign up. Highly recommended, even if you're not a senior or planning on traveling in an RV when you are one.